Mbarara — Ntare School has signed a Memorandum of Understanding (MoU) with the Confucius Institute at Makerere University to teach Chinese and become the centre of the language in the western region. The Chinese language director at Confucius Institute, Ms Xia Zhuoqiong, said at the launch of teaching the language on Saturday, that Ntare School has been given two teachers of Chinese and two others have been taken to China to train in the language. The Confucius Institute at Makerere University was launched in 2014 to teach Chinese language and culture to Ugandans. "We have been teaching Chinese as a short course to the general public and as part of Makerere University academic programmes. Ntare School now joins many other teaching centres that we have been launching in different parts of Uganda since we began this work," Ms Zhuoqiong said. Ms Zhuoqiong said since the Education ministry approved Chinese to be included on the curriculum, she is optimistic that students at the school will be sitting for the language proficiency examination in 2021 under Uganda National Examinations Board arrangement. She added that many schools have approached the Institute to get support in teaching Chinese but they have been hesitant to partner with some of them doubting their determination. "When Ntare approached us, we saw a dedicated school committed to the cause of teaching and without hesitation we gave them two teachers of Chinese," Ms Zhuoqiong said. The director of the Conficius Institute, Prof Oswald Ndoleriire, said Ntare School has been joined by other 30 all over the country in teaching Chinese language. He said: "We have witnessed the benefits associated with learning a foreign language specifically Chinese. Many young people in Uganda have been able to get jobs; others have got scholarships for further studies in China, business and travel opportunities. With this partnership we have started, in the month of July, 20 students of Ntare School will be heading to China for two weeks to study, experience the Chinese culture and tour China." 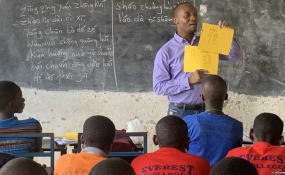 The head teacher, Mr Jimmy Turyagyenda, said the teaching of the Chinese language at Ntare School will help the country improve its relations with China since its economy is proving to be essential to the developing world. "As a school we are aware of the importance of teaching Chinese language. China's foreign policy is becoming more outward looking; her economy is apparently good and favourably competes with United States of America. Many Ugandans are flocking to China for trade and communication in business is key," Mr Turyagyenda said. He said the MoU helps the institution get training materials and support what is necessary for teaching Chinese including training teachers, and also has specifics on when one can pull out of the agreement. "As Ntare School, whatever we do, we perfect it. We shall make sure that we become a centre of excellence and referral when it comes to Chinese learning," he said.